In the past weeks I’ve seen a bit of discussion surrounding fast and slow learning experiences and the strategies for setting up and supporting each. Some voices advocate exclusively for a chronic learning journey, bemoaning things like performance support and on-demand learning. Others yearn for a more acute experience, providing just what folks need when they need it. Very few of these discussions seem to draw a dividing line between on-demand learning and support experiences (just in time) and protracted learning campaigns (spaced over time). But there does seem to be some polarization on the gradient between the long-game and the short-game. Why does it need to be one or the other? Can’t we have both? There is room for both a short and a long game for those looking to increase proficiency, maintain readiness, and get stuff done. In my view, there are three potential goal categories of change we want to encourage and assist. The goal category can be an indicator of short or long strategies. Here’s the way I think about teeing up opportunities for both short and long learning experiences. 1) We want workmates (and / or they want themselves) to be able to DO something they weren’t able to do before. To accomplish a task or demonstrate a skill that contributes to an outcome. 2) We want folks to BELIEVE or value something that’s important to the organization, to themselves, or improves the treatment of fellow humans. For example, it may be difficult to perform if you don’t believe in the organization, the product, the process, or yourself. Sometimes, many times, choosing the hard to do right thing is about valuing the right thing more than the easier to do wrong thing. 3) We want our partners to fill a job role and BE what they can be to the organization or for themselves. Advancing from apprentice to master, climbing the career ladder from entry level to master of craft. Growing to meet their potential. This mapping illustrates three related categories of accomplishment. Thinking this way, there’s a probably a greater chance that a DO goal will match a short-game strategy than a BE goal. Not always, but it’s likely that DO will be shorter term than BELIEVE and BELIEVE shorter than BE. This categorization could also provide some relational framing. For example, a BE goal could contain several smaller BELIEVE and DO goals, shorter strategies or campaigns that contribute to a long game strategy. A DO goal could contain a BELIEVE goal. A BELIEVE goal could contain DO goals, and so on. Mapping these frames could create a very complex picture of goals and sub-goals. This picture drives a conversation and produces questions that give birth to other questions. What business measure do we want to improve? What opportunities do we want to queue up? What does the entire canvas look like and when can we help? How is the business impeding (or providing counter-incentives to) these goals? When is it best for us to get out of the way and let people take control and plot their own course? 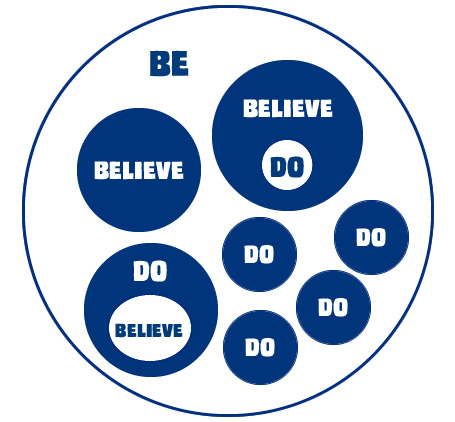 “DO, BELIEVE, and BE” is one way to frame the conversation around the ways we might want to move the needle. How do you frame your conversations? It’s almost as if you can’t have one without the other, but also as if they fall in an ordered fashion. Getting folks to BELIEVE in an organization must first come from the culture within, no? If I DO something that is of value to the org…and…I get recognized for that effort, my belief in the org strengthens. Over time folks see themselves as advancing to BE part of the future of the org. I like these not because of the categories but because it drives an examination of the relationships between doing, believing, and being. Describing BELIEVE in that context makes more sense now. Seeing how the three stand alone yet tie directly into each other opens up endless possibilities to explore the unknown of what is probably lying just under the surface of those relationships. Interesting aside, I taught electronic systems maintenance for awhile when I was on active duty. One of the mechanisms we used often to overcome barriers was the “I BELIEVE button.” When we anticipated folks would be confused about a new concept, we kindly asked them to push the I BELIEVE button for now. This cemented the what without the why getting in the way until we showed them more of the puzzle. Sometimes encouragement to believe that a concept is true (and not to get hung up on the why just yet) is all it takes to propel the experience. Fantastic piece and conversation. I like the framing of it and think it can be extremely helpful in and organization. I work at a Fortune 100 where training is looked at as the part instead of the whole. Our business understands that training is a small piece of performance change/improvement, but doesn’t quite have the right framing to make things happen. I read this and must admit I went to a, “There are so many factors out of our control that would influence this.” place. But I think the framework helps start the right conversations. Example: I need to teach storytelling to a design group. They Believe in it (we’ve sold the value), they Do it (lot’s of practice at a workshop and even in their teams, but they really aren’t Being It. 5) Feedback: Where’s the coach? The expert? The grand poobah of storytelling? Who is going to tell me what I’m doing right or wrong? Great ideas and thanks for sharing.